Patti Maes and Pranav Mistry of the MIT Average Lab 's new Fluid Interfaces Group show an interesting project on the development of one species of sixth sense by means of a portable device that allows the interaction with the environment. The prototype is made of a pocket-size projector, a mirror and a camera. The hardware components are coupled in a pendant of portable devices like mobile phones. Both the projector and the camera are connected to devices of movable computing in the user’s pocket. 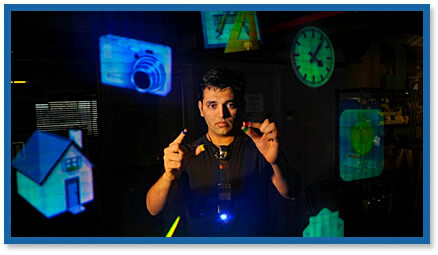 The projector enables the display of visual information over several surfaces, walls and physical objects that surround us to be used as interfaces, while the camera recognizes actions and gestures of the user using vision- based techniques. 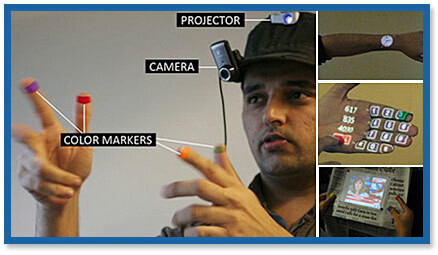 The program processes the video-stream data captured by the camera and the actions through visual tracking of the user’s fingertips using simple computer-vision techniques. The interaction by means of motions and dispositions of these gestures are interpreted as instructions for these gestural fluid interfaces. SixthSense is a true portable gestural interface that augments the contact with the real physical world that surrounds us with the digital information and allows us to use natural gestures to interact with that information. When we came across something or somebody somewhere, we use our five senses to perceive information; that information helps us to decide and to choose the right to take actions. But, sometimes, no doubt, the most useful information that can help us to take the right decision is not naturally perceptible with all five senses, that's to say, data, information and knowledge in digital supports (web) and that can be required in a given minute to take a decision out of our office or house. Although the miniaturization of computing devices today allows us to carry the computers in our pockets, it does not exist any relation between our digital devices and our interactions with the physical world. The information is traditionally limited to paper or digitally to a screen. 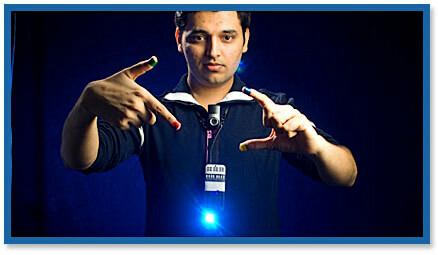 SixthSense generates a new interface that connects the intangibility of the digital information with the tangible world allowing us to interact with this information by means of natural gestures. SixthSense allows the user drawing icons or symbols on the air using the motion of the forefinger and the system recognizes the interactions as symbols and instructions. For example, drawing a lens-symbol carries the user to the map or diagram application a ‘@’ symbol opens the user's e-mail. The system also increases the interaction with physical objects allowing the user to interact with the projection of more information related to these objects projecting on them. For example, a newspaper can show on-line video of news or the dynamic information can be provided in a piece of ordinary paper.